One of the biggest crises in the history of U.S.-Pakistan relations has been resolved with the release of a CIA contractor charged with double murder. Raymond Davis was set free by a court in the eastern Pakistani city of Lahore after family members of the victims submitted affidavits saying they were prepared to forgive Davis in return for blood money. The release marks the end of tensions that had plunged relations between the top intelligence agencies of the two countries, already fractious allies, to a low point. While Davis' release may improve ties between Washington and Islamabad, it is further inflaming the Pakistani public, with whom the case had generated a fierce wave of anti-American sentiment. Much of the local media are taking a hostile position, denouncing the outcome of the case and reporting that the victims' families were pressured into accepting the blood money. (Some originally refused.) And some commentators say the court's verdict is further evidence of Pakistani weakness. Already, an angry backlash has begun, including street protests. Under Pakistani law, blood money is a legal means of securing forgiveness from victims. Under the qasas and diyat laws, derived from Islamic jurisprudence, a court can release an accused person if the victim's family agrees to a satisfactory cash settlement. The Shari'a-based laws are invoked in the majority of murder cases, Pakistani legal experts say. According to government officials in Punjab, Davis was charged with murder on Wednesday but then acquitted after the families of the two victims said in court that they forgave the CIA contractor and submitted documents attesting to that. Senior Pakistani officials tell TIME that each victim's family received $700,000 in compensation, for a total of $1.4 million. 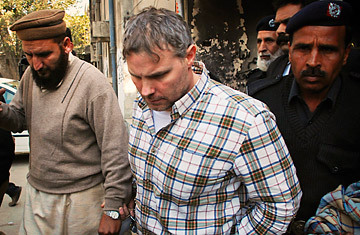 The formula to secure Davis' release was devised by Husain Haqqani, Pakistan's ambassador to the U.S. Haqqani, who is well versed in Islamic law, first discussed the proposal with Senator John Kerry, chairman of the Senate Foreign Relations Committee and co-author of a major aid package for Pakistan, Pakistani officials tell TIME. By invoking the Shari'a-based provision, the two countries could work together toward a settlement that did not have to rely on Davis' disputed status as a diplomat protected under the Vienna Convention and immune from prosecution. While Washington has always maintained that Davis was protected under diplomatic immunity, Shah Mahmood Qureshi, the Foreign Minister at the time, said he wasn't. A Lahore court ruled that Davis didn't enjoy diplomatic immunity last week. Kerry took the proposal to Pakistan in late February and discussed it with senior Pakistani leaders from all sides. As TIME reported on Feb. 26, the proposal was then taken up as part of direct negotiations between the CIA and its Pakistani equivalent, the ISI. By not accepting Washington's claims of immunity and leaving the issue unresolved, Pakistan was allowed to "save face," a senior Pakistan official says. The Pakistan government insisted that the matter be resolved through the country's court system. But the two sides did not reach an immediate agreement. The negotiations were drawn out and, in the process, pressure was discreetly applied on the civilian government by the ISI to secure an unprecedented two-year extension for its chief, Lieut. General Ahmed Shuja Pasha. The message was that it would not be prudent to replace him amid a major crisis involving the CIA. Pasha, who was already on a one-year extension, was due to retire on March 18, his 59th birthday. Some observers believe that Saudi Arabia might have played a mediating role, but officials denied it. The hope was that Riyadh would be able to tamp down tensions between the CIA and the ISI, with Saudi intelligence chief Prince Muqrin bin Abdul-Aziz Al Saud playing a role. The Saudis might also have been able to cool those among Pakistan's religious right who had been taking to the streets in the tens of thousands to demand that Davis be hanged. Riyadh wields some influence over the Punjab government, which is headed by the younger brother of former Prime Minister Nawaz Sharif, a prominent Saudi ally. In the end, the Saudi role was not needed, because the Punjab government chose not to interfere with the settlement or seek to undermine it. The ISI approached the families of the victims and asked them to accept compensation, Pakistani officials tell TIME. Eventually, 18 members of the victims' families signed affidavits saying they were prepared to forgive Davis. On Wednesday, the Lahore court also acquitted Davis on the charge of possessing illegal weapons, after fining him $235 and saying that time already spent in prison was punishment enough. Davis has now left Pakistan for Kabul and is expected to travel to the U.S. soon.